The Ridgewood Historical Society is the parent organization of the Schoolhouse Museum which annually presents a themed exhibit featuring artifacts from the collection, and presents educational programs featuring local people with knowledge and/or skills that pertain to the collection. Tradition has it that the original 18th century land grant given to the Dutch Reformed congregation from Pierre Fauconier and his daughter Magdalena Valleau stated that a school should be always be provided on the property. The consistory assumed the responsibility for education and number of different school buildings were on the site since the first church was erected in 1735. This one-room schoolhouse, built in 1872, operated as a public school until 1905. It was then part of the district school system which formed around 1864 and operated as School District No. 45. When the towns incorporated in 1894, the district system was dissolved and the schoolhouse became part of the Ridgewood school system. The schoolhouse was built at a cost of $4,600. The original building was divided into separate entrances with cloakrooms for boys and girls grade in grades 1 through 8. The potbelly stove is original and also the windows and the two central lamps. The black boards around the room have been removed except for one behind the teacher’s platform. A large bell once summoned children from miles away to school each morning. The original belfry is gone, and the bell was used in other schools and a church after the schoolhouse closed in 1905, but was returned to the Historical Society in 1977. Outdoor boy and girl privies were later attached to the main building to create additional display space. The schoolhouse is on the National Register of Historic Places as is the bordering Old Paramus Church, and Valleau Cemetery. 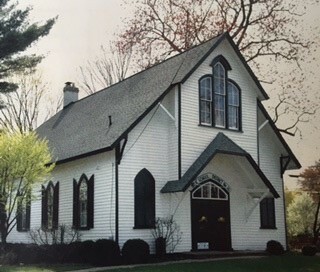 It remains the property of the Dutch Reformed Church, but is maintained by the Ridgewood Historical Society where it houses its’ collection and operates the Schoolhouse Museum.